After eyeballing the spherical shape using a mixture of cutting tools, rasps and files, I wet-sanded the tool marks off and polished it with red and green compound. Then I parted it off (pictured above) and drilled the mounting hole. I was going to measure the sphericity I got by eye but decided I’d rather not know. 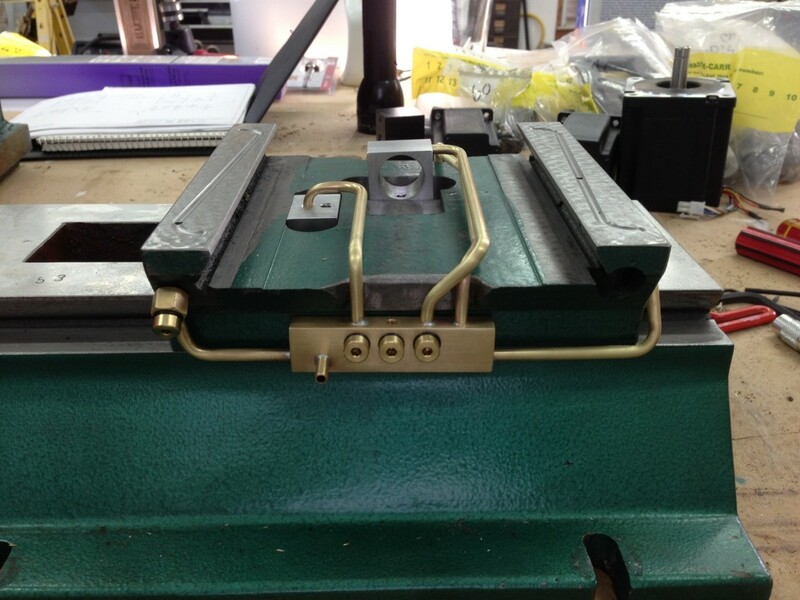 milling machine modifications, part __? In this minor modification I added a 50 lb. 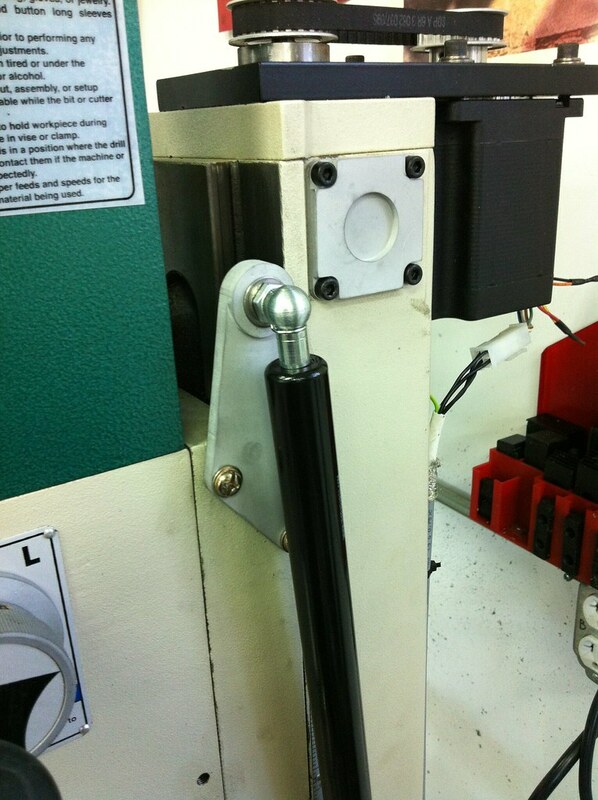 gas spring between the column and the head, meant to assist the Z-axis motor in lifting the weight of the head. The stock part is a 50 lb. gas spring with ball-joint fittings, McMaster part #4138T621. I simply drilled a hole in the column (and tapped it for 5/16-18) for the lower pivot, but the upper pivot point wanted to be above the top of the head to allow for a full 12″ of travel. I designed and machined a simple aluminum part to extend the upper pivot point and mounted it to the head. 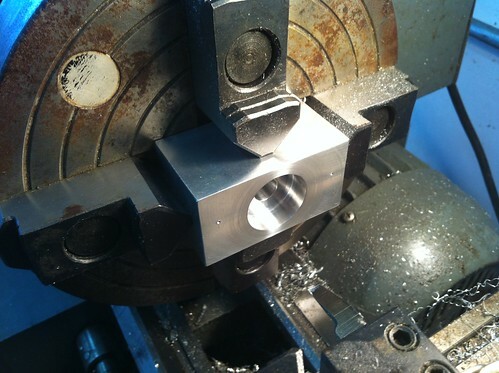 While I was at it I also machined a nice little cap to cover the hole where the Z-axis crank was. The backlash in the lead screws has been giving me relatively poor surface finishes, so I bead blasted these parts to even them out. I like the look, but the “toothy” surface really grabs onto dirt. I was hoping to double the rapid speed I could get out of the Z-axis, but I didn’t quite make it… It went from 15 in/min to about 25 in/min, although I just bought some better way oil so we’ll see if that makes up the difference. 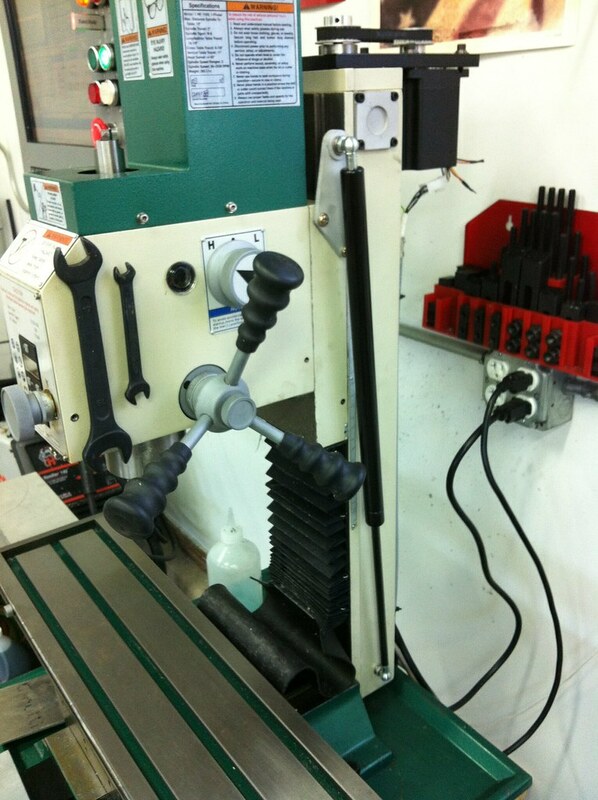 Posted in CNC milling machine | Comments Off on milling machine modifications, part __? 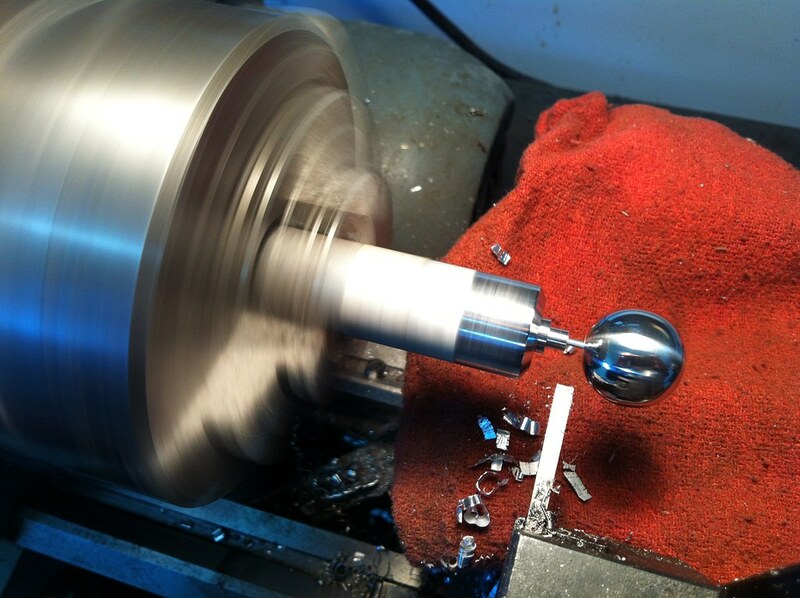 This weekend I spent a lot of time in the shop machining parts for my CNC mill, and ran into a problem with the lathe. The four jaw chuck has these adjustment screws to move the jaws in and out, but I can’t find the chuck key needed to adjust them. They use an inverted key–it’s and innie, not an outie, like most chuck keys–and it’s almost impossible to adjust without that particular tool. 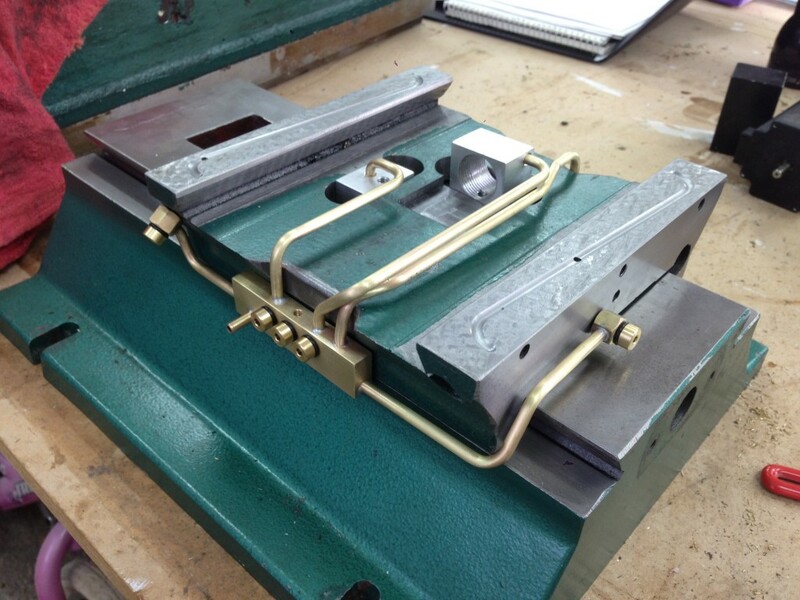 The ends were machined on the mill, clamping the piece upright in the vise. 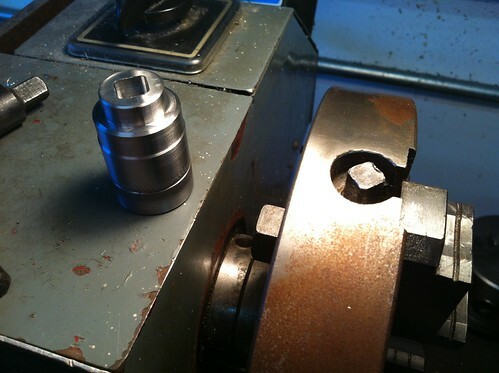 The shoulder was turned on the lathe (in the three jaw chuck!). 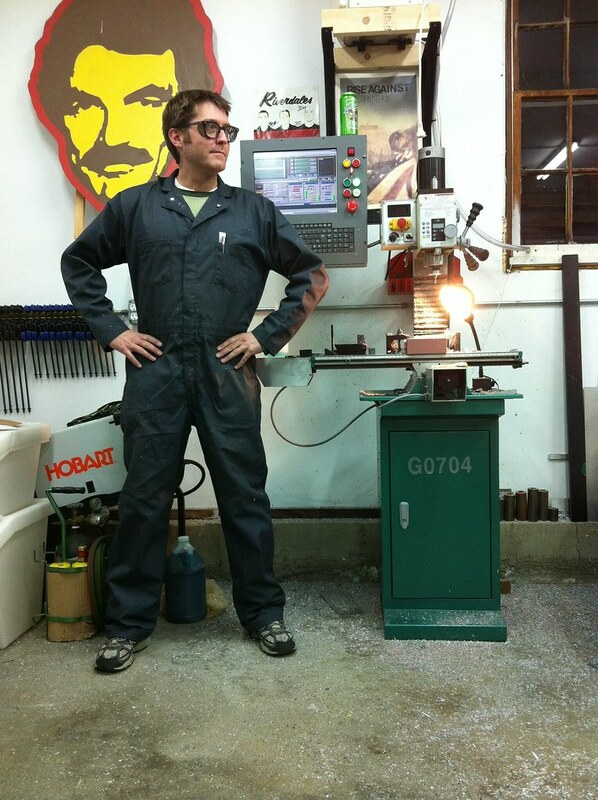 This is it… Grizzly Miller is in several large pieces on my bench, and the major upgrades have begun. First up, oiling system. 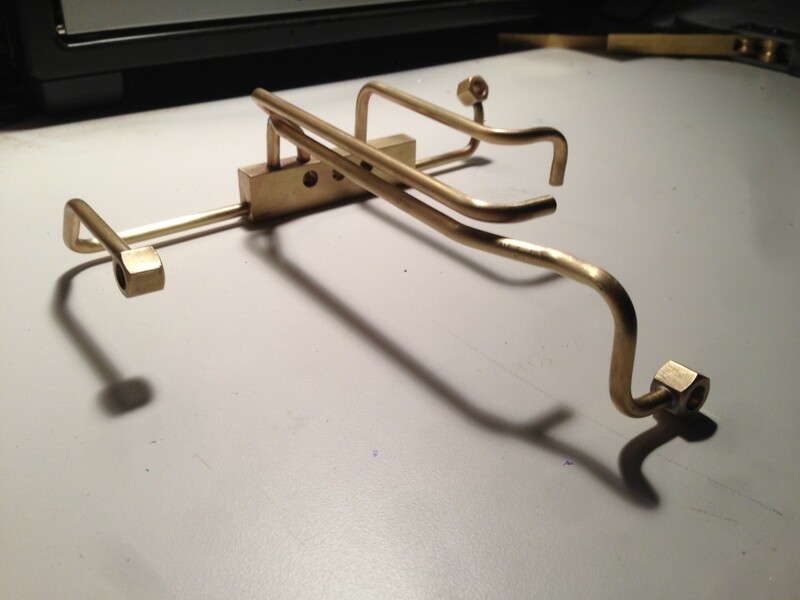 I made some refinements to the original concept and even built a tube-bending tool for the small brass tube I’ll be using. 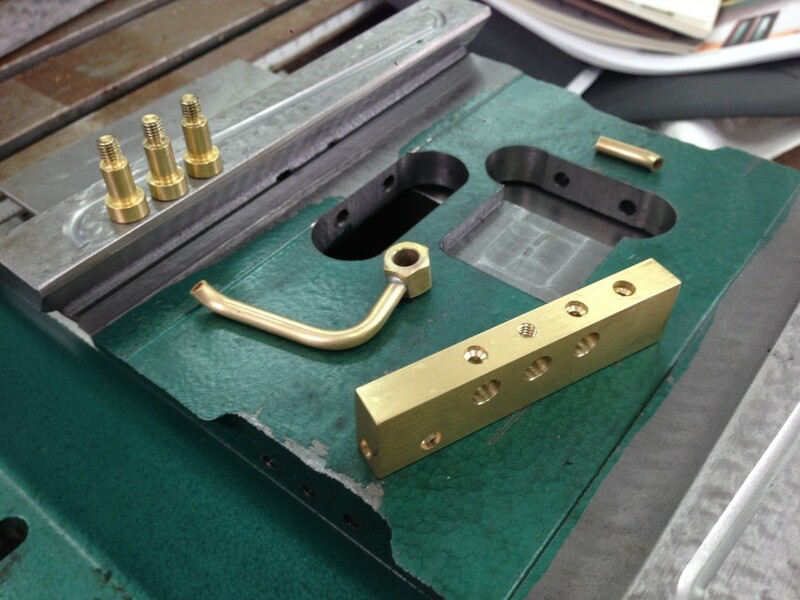 First step was machining the X and Y axis ways on the mill’s cross slide. I used a simple ‘S’ curve, programmed point-by-point into an old ProtoTRAK-converted Bridgeport. 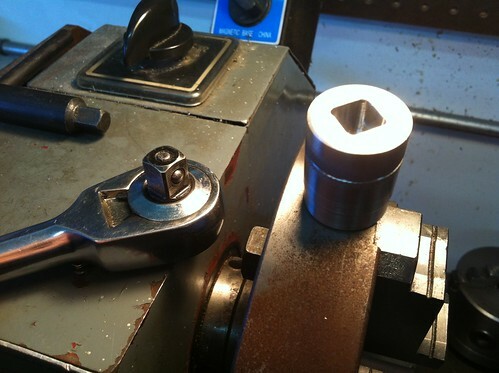 On the same machine I pocketed out some clearance for the X-axis ball nut. 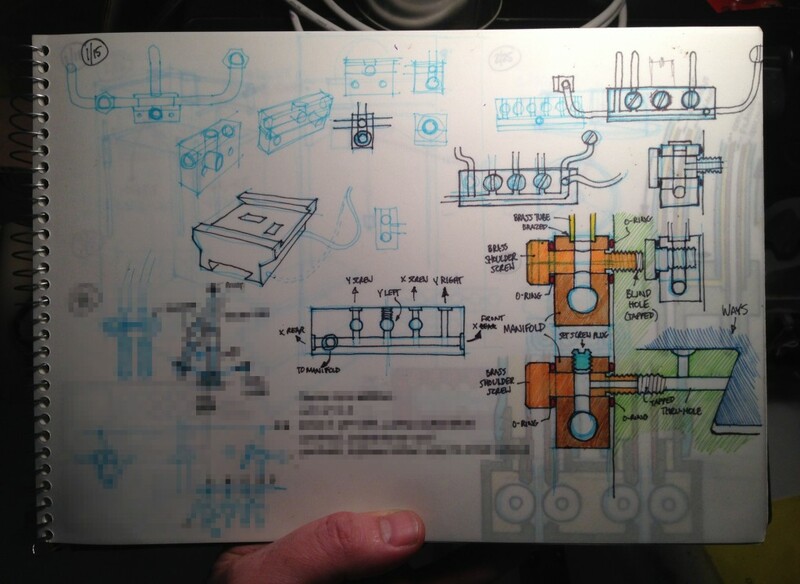 Beyond these sketches, most of the design work happened on-the-fly. This is unusual for me, but I don’t have CAD data of the original milling machine parts, and tube fabrication turns out to be more sculpture than engineering anyway. I also bought a silver solder kit specifically meant for joining copper alloys, and tried a small test piece from some scrap material. 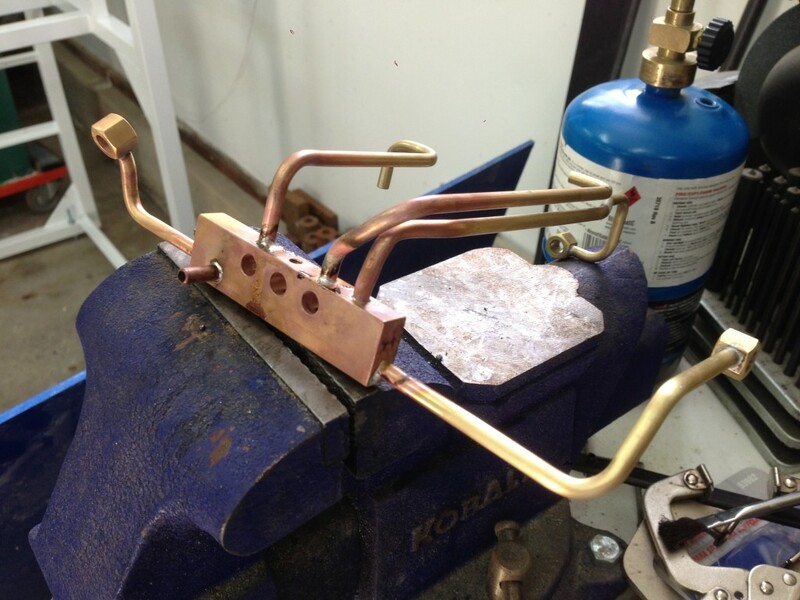 I then fabricated the main brass manifold and mounted it to the cross slide. From there it was a matter of drilling end points in the cross slide and connecting the dots with brass tubing. Each of the four ways are connected with my modified banjo fitting, which allows for flow control adjustments. 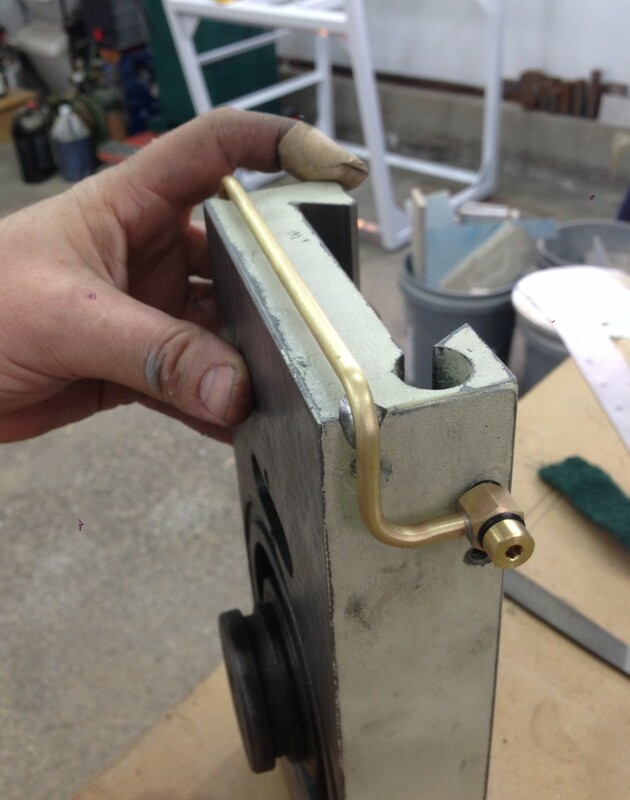 The two ball nut mounts were modified to accept an oiling tube, which will simply splash each ball screw with oil. 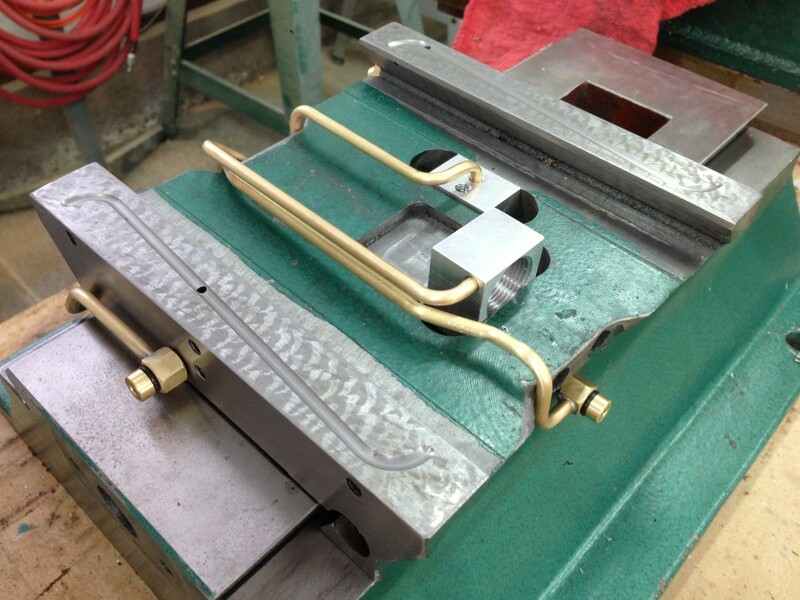 The manifold will be fed by a flexible tube, which will attach to the little stub coming off the manifold. The soldering process is messy and dangerous, but once the parts are cleaned up they’re really quite beautiful.